In last week’s post, I talked about the approach I’ve added to my morning routine, particularly the process of filling out a morning journal. A section of that journal is focused on writing out your most important objective (i.e. goal, project, or desire) to improve your focus on your goal. I explained why in last week’s post. I want to address this point because I discuss the ideals of goals vs. systems in my book, Optimize for Victory. While I think it’s important to set goals, I caution people to ensure they do not get overly focused on their goals without having a consistent system or process in place to achieve them. In many cases, we can get overwhelmed by the idea that something is missing in our lives, hence the goal; in fact, we can get so focused on the lack of it, that the stress related to achieving that goal can backfire on us. We may end up putting it off or not achieving it at all. Therefore, I recommend a hybrid approach in my book. I do not think adding the morning journal opposes that. 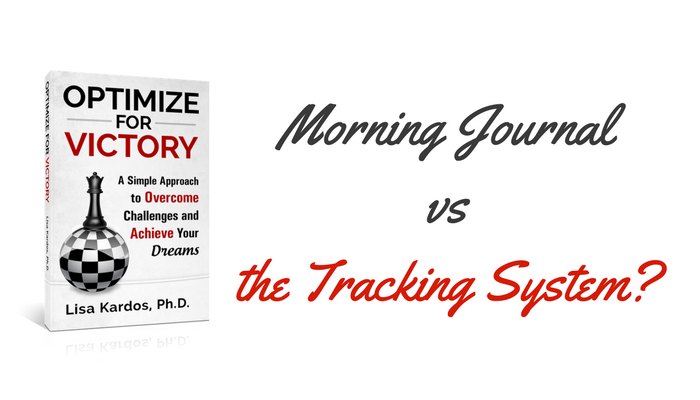 If anything, I think it complements the Tracking System I talk about in my book, a system for getting things done. Crystallizing your focus on what’s important through the morning can help you gain clarity while you continue to work with your robust system to achieve your projects and dreams. Don’t forget to get cash back when you shop through Ebates this holiday season! Check out my #AmazonInfluencer Gift Guide page!